In this lesson, we will learn how to analyze square root functions, graph them, find their domains and ranges, and use them to solve real-world problems. Find the domain of the function 𝑓 ( 𝑥 ) = √ 7 𝑥 − 7 . What is the domain of the function √ 𝑥 ? Find the domain of the function 𝑓 ( 𝑥 ) = √ − 5 5 − 7 𝑥 in ℝ . Find the domain of the function 𝑓 ( 𝑥 ) = √ 𝑥 − 2 7 . Determine the domain of the function 𝑓 ( 𝑥 ) = √ − 8 𝑥 + 1 6 . What is the domain of the function 𝑓 ( 𝑥 ) = √ 1 − 𝑥 ? Determine the domain of the function 𝑓 ( 𝑥 ) = √ 𝑥 + 5 𝑥 − 5 . Find the domain of the function 𝑓 ( 𝑥 ) = 6 √ 2 5 3 𝑥 + 4 9 8 𝑥 + 2 2 4 2 . Determine the domain of the function 𝑓 ( 𝑥 ) = √ 5 − 𝑥 √ 𝑥 + 2 . Determine the domain of the function 𝑓 ( 𝑥 ) = 5 𝑥 √ 3 𝑥 − 5 in ℝ . Find the domain of the function 𝑓 ( 𝑥 ) = 3 √ 2 9 4 + 1 7 5 𝑥 − 3 0 4 𝑥 2 . Determine the domain of the function 𝑓 ( 𝑥 ) = √ 𝑥 + 7 √ 𝑥 − 5 . If 𝑓 and 𝑔 are two real functions where 𝑓 ( 𝑥 ) = 𝑥 + 𝑥 2 and 𝑔 ( 𝑥 ) = √ 𝑥 + 5 , find the domain of the function  𝑓 𝑔  . Find the domain of the function 𝑓 ( 𝑥 ) = 6 √ 9 − 2 5 𝑥 2 in ℝ . Determine the domain of the function 𝑓 ( 𝑥 ) = √ 𝑥 + 1 𝑥 − 1 6 2 . If 𝑓 and 𝑔 are two real functions where 𝑓 ( 𝑥 ) = 𝑥 − 4 2 and 𝑔 ( 𝑥 ) = √ 8 − 𝑥 , determine the domain of the function  𝑔 𝑓  . Find the domain of the function 𝑓 ( 𝑥 ) = 6 √ − 9 9 − 8 𝑥 . Determine the domain of the function 𝑓 ( 𝑥 ) = 2 √ 8 6 − | 𝑥 | . 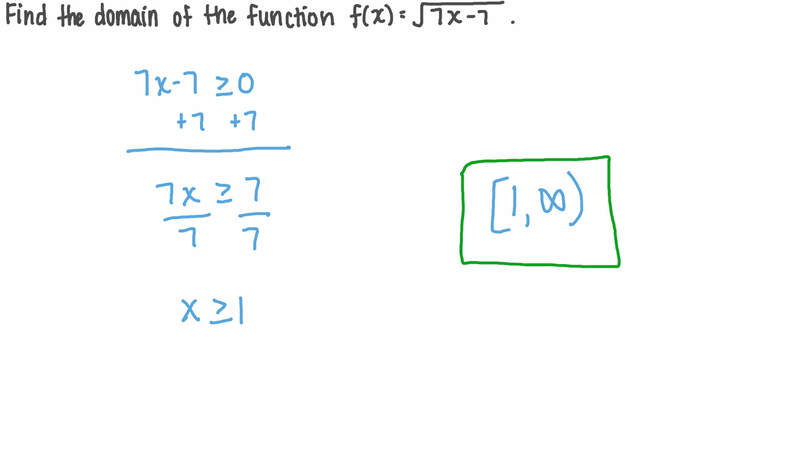 Give the domain of the function . Given the function 𝑡 ( 𝑠 ) = 1 5 − √ 𝑥 − 1 3 , evaluate 𝑡 ( 9 ) . What is the domain of the function 𝑓 ( 𝑥 ) = ( 1 − 𝑥 )   ? Determine the domain of the function 𝑓 ( 𝑥 ) = √ 4 𝑥 + 3 3 . Determine the domain of the function 𝑓 ( 𝑥 ) = √ 2 7 − | 𝑥 | . What is the domain of the function 𝑓 ( 𝑥 ) = ( 1 − 𝑥 ) 2 3 ? Find the domain of the function 𝑓 ( 𝑥 ) = √ 1 0 + 1 1 𝑥 − 3 5 𝑥 2 .